After having talked about the various types of moisture in my previous blog post, today I want to talk about a recently purchased serum, which looks promising so far. The Gotukola Indian Ginseng Rejuvenating Beauty Elixir by the Ayurvedic brand Just Herbs. A lightweight serum to be used at night to target concerns like aging, hyperpigmentation and dullness. The blurb on the company's website calls it: This multi-tasking night serum is a synergistic blend of treasured Indian herbs to nourish and restore a natural glow and youthfulness to tired, ageing and pigmented skin. Plant polyphenols, carotenoids and flavonoids present in these precious botanicals prevent and reverse free-radical and DNA damage and block the inflammatory changes that result during the skin ageing process. As the long product name suggests, the serum contains Gotukola, which is basically brahmi or centella, used for ages in Indian haircare products. Honestly, this is the first time I have come across centella in an Indian skincare product. Korean skincare products, which I have said are miles ahead of skincare products found elsewhere, have been using centella for quite some time now. An example of highly-raved centella-based Korean products is the Cosrx centella anti-blemish range. 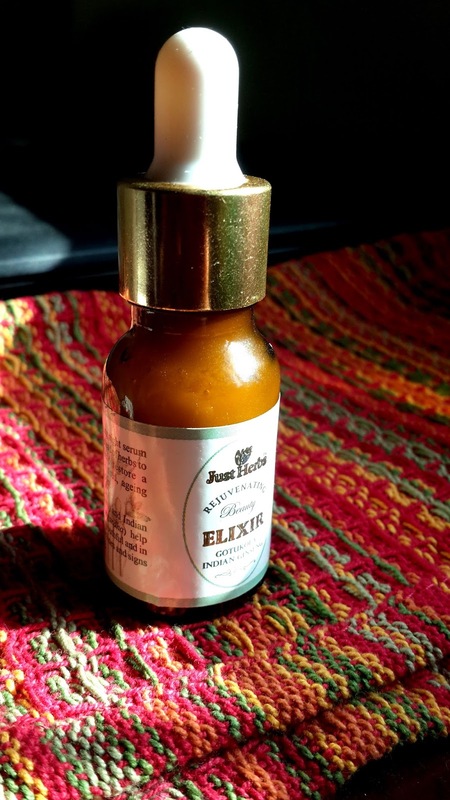 Anyway, coming back to the Just Herbs elixir, it also contains Indian Ginseng or Ashwagandha, known for its antioxidant and anti-inflammatory properties. It contains cold-pressed oils of rosehip (excellent for combating dryness), wheatgerm, safflower and one of my favourite skincare ingredients, moringa seeds, which come from the drumstick tree. Who would have thought! It also has liquorice (for brightening) and nagkesar for its retexturising, toning and firming properties. Last but not least, the elixir also contains Indian Senna, which is considered to be a good alternative to the moisture powerhouse ingredient hyaluronic acid. Now, here's where I have a small problem with this product. Although the tinted glass bottle with its pipette looks appealing, it's cumbersome having to unscrew the bottle, press the pipette, dispense and then screw back. I wish Just Herbs would consider a pump-style bottle, which is much easier to use--pump and go. Like most serums, you take a pea-sized amount on your fingertips and gently press onto cleansed and toned skin. A heads-up for those who want to know what it smells like--sweet bread! Yep, it smells like sugared bread--think Wibs Tooty Fruity bread. It doesn't bother me as once you put it on, the smell dissipates. This is the part that matters the most. To begin with, the serum, being lightweight, is a joy to use, especially on combination skin types, which is my skin type. The moment you press it in the skin, you can almost feel a 'sluuurrrppp' moment taking place, which is my way of saying that the skin has greedily soaked it all in. This moisture-gulping property can be attributed to the Indian Senna, which instantly adds hydration to the skin. Having said that, this is a serum, which does not replace a moisturiser, at least for me. Even though the elixir contains emollient oils, I need a moisturiser on top to help 'seal in' the moisture. Plus, the meagre quantity of the serum means that you'd be using more than is required if you use it as a moisturiser. Claim-wise, the serum does help in evening out the skin tone, however, since I don't suffer from major hyperpigmentation, I cannot comment on that part. The hydrating quality helps in filling any fine lines and gives an instant plumping effect. So, dullness--check, hydration--check. Compared to most Indian skincare products, the elixir's price might seem a bit steep; Rs. 985 for a meagre 15 ml. For that price, I would have hoped for a 30 ml. Then again, I have used more expensive products with similar quality so I shouldn't be complaining. Go for it! It's worth a try simply because it's hard to come by a good-quality serum in the Indian skincare market. Tip: if you have always found eye creams to be rather heavy and oily around the eyes, try this serum in that area. No irritations (at least for me), maximum hydration and no icky feeling after application. Like I said, sluuuurrrp!